Cute cast iron chiminea, 86cm tall with a small 14cm cooking grid. The chiminea is great as a patio heater as it is cast iron it heats up very quickly and retains heat for a long time. 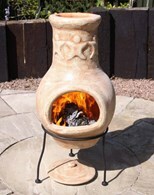 The chimenea can also be used indoors with one of our bio ethanol burners, purchased separately, as an indoor heater. 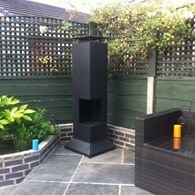 The chiminea is a multi fuel stove and can use either wood, coal or bio ethanol burners. The stove can also be taken camping due to its portable small size and cooking ability. Please note: The item no longer has handles on it due to a new design. There are no reviews for Small Cast Iron Chimenea Multi Fuel Indoor or Outdoor Wood Burning Stove.